• High Hex Washer Head provides driving stability. • Milled sharp point for superoir drilling and quicker installation. Self drills through up to 24 Gauge metal. • Assembled with a bonded seal washer for a consistent, weather tight seal and improved installation appearance. 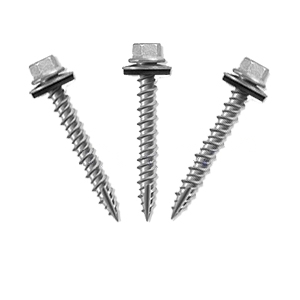 • Self drills through up to 24 gauge metal panel and taps into wood substrate. • Zinc plated and Silver Sentri coated for long term corrosion protection. OPTIONS: Available painted, and in lengths from 1 to 3"